Many of you may be familiar with the adage, “It’s five ‘o’ clock somewhere.” To those of you struggling with what we hope are the last throes of winter: It’s summer somewhere. That somewhere would be the entire southern hemisphere, but specifically, it’s summer in one of my favorite culinary destinations, Peru. I’d like to lead you on a tour of Peruvian cuisine. Join me where it’s warm! There’s more to Peru than ceviche, Pisco Sours, and Machu Picchu. For starters, the Peruvian coast certainly has an abundance of great seafood. I would argue that Peru does ceviche best, and I think many would back up that claim. Ceviche, oversized corn, and sweet potatoes essentially is Peru’s national meal – and with good reason. The best I had was not in one of celebrity chef Gaston’s deservedly acclaimed restaurants, but instead made in a Lima native’s kitchen by a friend and his mother – who clearly taught her son well! My next best ceviche experience was at La Mar, a trendy cebicheria on the northern fringes of Miraflores within Lima. Yes, if you Google it, you’ll see that La Mar is in such high demand that The Gaston (that would be Gaston Acurio) has opened other La Mar locations in Chile, Colombia, Panama, and even New York and San Francisco. Their expansive menu of ceviches – featuring almost every variety and combination of seafood, as well as flavorings, are complemented by their addictive homemade plantain and sweet potato chips, served with homemade condiments. 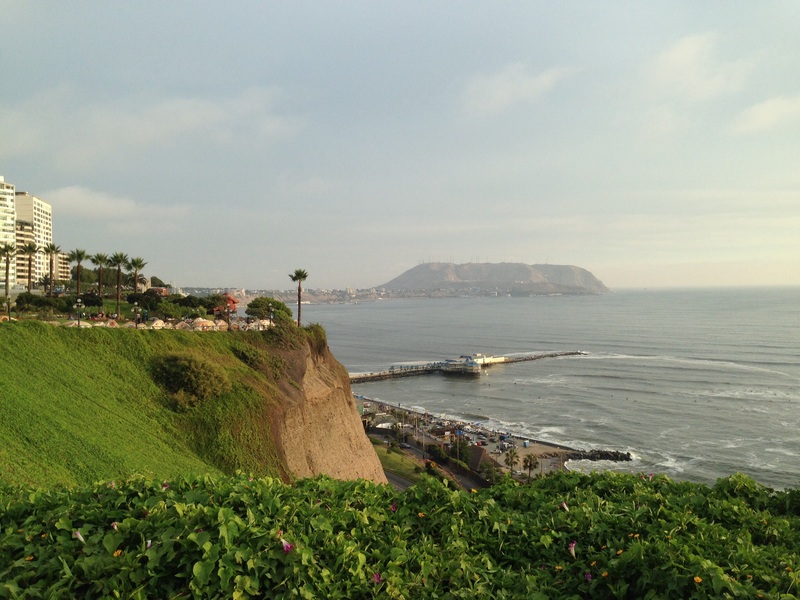 What you may not have considered is the influence of immigrants on Peruvian cuisine. Fusion is not a fad in coastal Peru; it is a way of life. Asian, and especially Japanese immigrants in the major metropolitan area that is Lima, have led to a plethora of sushi, as well as Chinese, restaurants. Other Andean staples, such as the regional classic, lomo saltado (sautéed beef, usually with onions and peppers) and quinoa take on Asian or European influences. I became enamored with lomo saltado risotto and quinoto (quinoa risotto) during my visits to Peru. The Peruvian take on risotto is a bit saltier, the rice a bit longer-grained. Quinoto is a glorious marriage between quinoa and heavy cream. Another friend killed my quinoto buzz by asking me if I knew how unhealthy quinoto was. In fairness, she did have a duty to warn, but it is as good as you can possibly think. My argument is that the cream might be unhealthy, but quinoa remains packed with fiber and protein. Do I eat it everyday? No. But quinoto still is a must-try if you travel to Peru. More adventurous travelers may be inclined to try alpaca steak or cuy (guinea pig). Though I’m always a bit more wary of meat adventures than vegetables, I have to say that I was very impressed with how tender and not at all gamey every instance of alpaca was – both in Peru and Bolivia. Whether dining on alpaca steak alfresco at Huaca Pucllana, a high-end tourist destination situated among Incan ruins, an oasis not far from the centro historico (old town center) in Lima, or eating delicate alpaca carpaccio with sushi at trendy Limo 11,000 feet (3400 meters) above sea level in historic Cuzco, alpaca is definitely worth a try. I only managed a bite of cuy, which almost looks a bit like quail when cooked, but my friends were not at all put off by it. If you’ve been following this blog, you know I have a sweet tooth and, more importantly, a special love for chocolate. So I’d be remiss if I didn’t mention locally sourced chocolate. Some of your favorite ‘European’ chocolates likely originate from Peruvian cacao beans, and Peru’s chocolate manufacturing industry continues to grow and improve product quality. Peruvian grocery chains like Wong and Vivanda carry a selection of great local chocolate bars and gift sets. If dark chocolate with pink pepper corns, cacao nibs, or roasted corn strikes your fancy, you can find each of those flavors. If you’re not a fan of chocolate but looking for something ‘local’, healthy, and sweet, you will find no shortage of exotic fruit from the Amazon basin – mangoes, papaya, maracuya (passion fruit),and tumbo (a tart cousin of starfruit shaped like a banana). I hope this post has piqued your curiosity to learn more about Peru as a cultural and gastronomic destination. While this post only attempted to scratch the surface of Peru’s abundance of great cuisine, I’ll go into a bit more depth in the next few posts.